Replacement engine to be installed or by choice of prospective client. All accomodation to be constructed either by client or by arrangement. Navigation and safety equipment to be either added by client or by arrangement. The layout can be changed easily as the internal bulkhead and wheelhouse style bathroom is fitted but is now ready for the finishing touches . Her interior is being finished as we speak and the images show the progress, NEW photos will be added each week.She is fully water ready, the keep it simple ethos means that all systems are manudraulic and easy to operate and maintain. Large fuel tanks are fitted with a Diesel Boiler feed out to enable heating to radiators. In addition there is a hearth and a stove, though this too can be changed to a customers final spec. 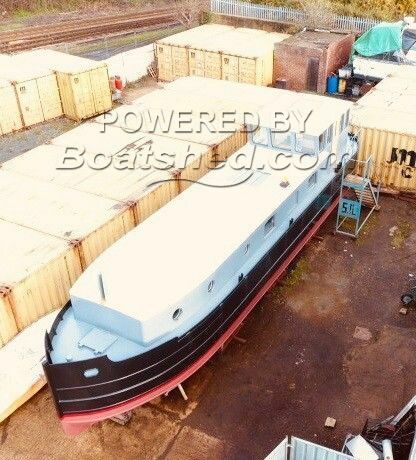 This barge, is finished and is water ready subject to customer spec and the internal fit out is at your choice, either as a self finish or it can be finished at the yard. This is an amazing opportunity to purchase a barge that is effectively brand new and water ready. Great Opportunity. Assistance locating a mooring if required and part finance may be available. NOW AT A MASSIVELY REDUCED PRICE!!! This Barge Wide Beam has been personally photographed and viewed by Geoff Jaquest of Boatshed Suffolk. Click here for contact details.